Haws DUO personal eyewash stations are wall-mounted, dual bottle and single bottle personal eyewash stations that are unique to the eyewash industry. Options include Sterile pH Neutral solution and Sterile Saline solution bottles. The sterile pH Neutral phosphate solution is able to neutralize any acidic or alkali substance that enters the eyes to help restore a proper pH balance for a 2 minute period. The saline is used afterward to rinse the eyes for a period of 5 minutes either after the pH solution is used or on its own. May be purchased in different models including the pH bottle and saline, 2 saline bottles, single or double bottle eyewash, replacement bottles and dust proof stations. With two eyewash streams, the DUO eyewash bottles provide simultaneous eye coverage allowing for both eyes to be treated with an advanced rinse process for supplementary flushing support. The ergonomic eyecups provide for an effective and comfortable flushing flow. To activate, twist the cap in the direction of the arrow and place eyecups over the affected eyes. Tilt head backwards with eyes open wide and squeeze the bottle to provide the desired flow level. Recommended wash time is 2 minutes with the pH Neutralizer followed by 5 minutes with the Saline solution. Haws Personal Emergency Eyewashes are used when dirt, dust or other contaminants come into contact with the eyes. 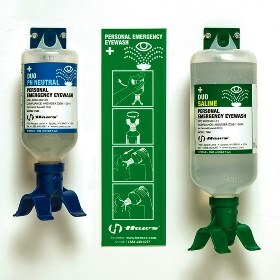 The eyewashes provide immediate flushing fluid while the injured person is en route to a primary emergency station. Includes an identification instruction wall sign. Fluid carries a 3 year shelf life. Store at room temperature 41-95° F (5-35° C).